We all love spending time with likeminded people, don’t we? So, when a keen diver from Newquay contacts me to request a guided rockpooling tour, I can’t resist. Unusually for a bank holiday weekend, the sun pushes the clouds away and leaves behind a perfect, calm shore ready for us to explore. We’ve barely known each other a minute before we’re enthusing about the joys of going slowly and taking the time to look for underwater life. 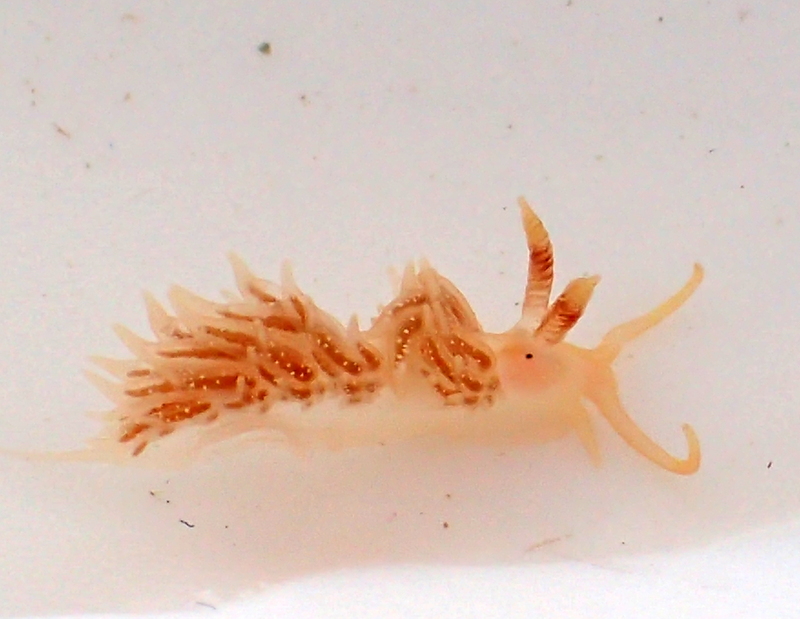 We discover our shared love of nudibranchs (sea slugs – read on, they’re lovely, really!). I assure my new friend that we’ll find plenty of wildlife, including some species few divers ever see, and all with minimum kit, no buoyancy control and a limitless supply of air. 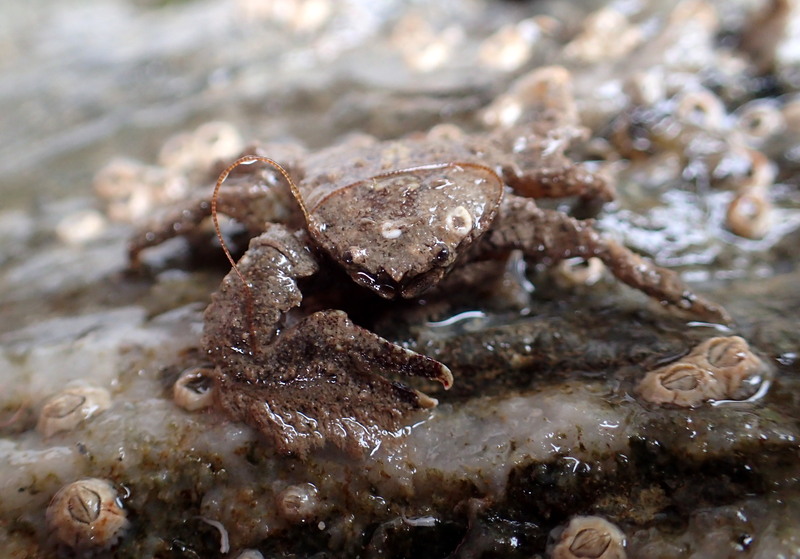 Despite being familiar with edible crabs and velvet swimming crabs from diving, there are several species of intertidal crabs that are new to my guest. 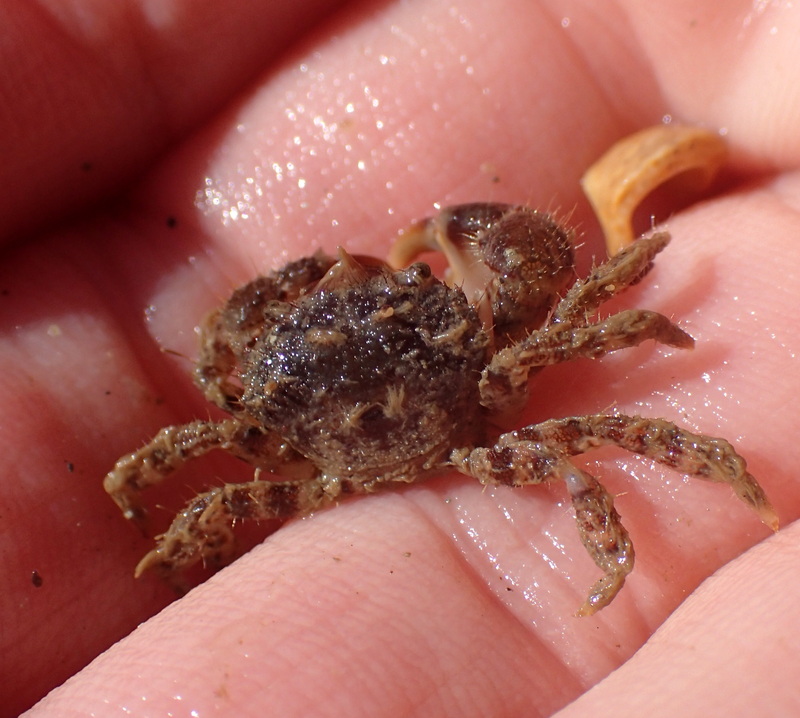 We find plenty of broad clawed porcelain crabs and long clawed porcelain crabs clinging to the underside of the rocks. 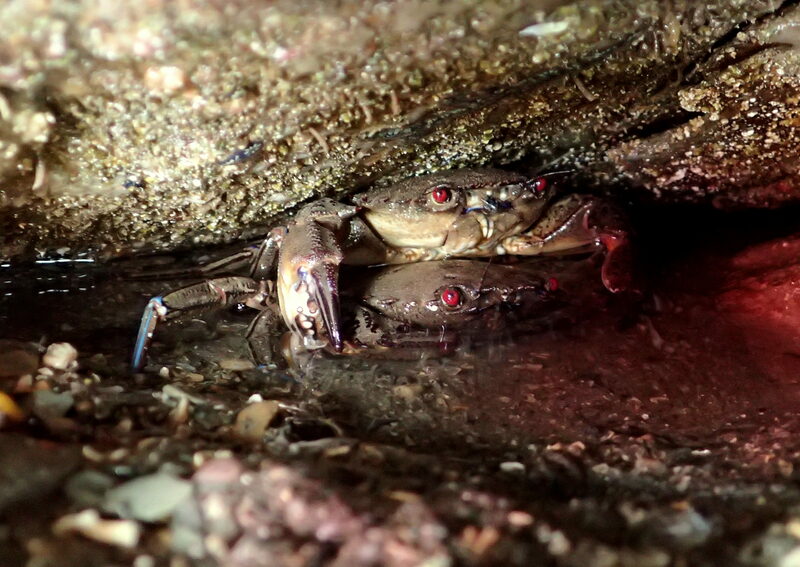 A quick leg count shows that these are not ‘true crabs’, which have ten legs, but a different group with just eight legs. Pleased to meet you! A broad-clawed porcelain crab extends a claw. Another new group are the Xanthos crabs. 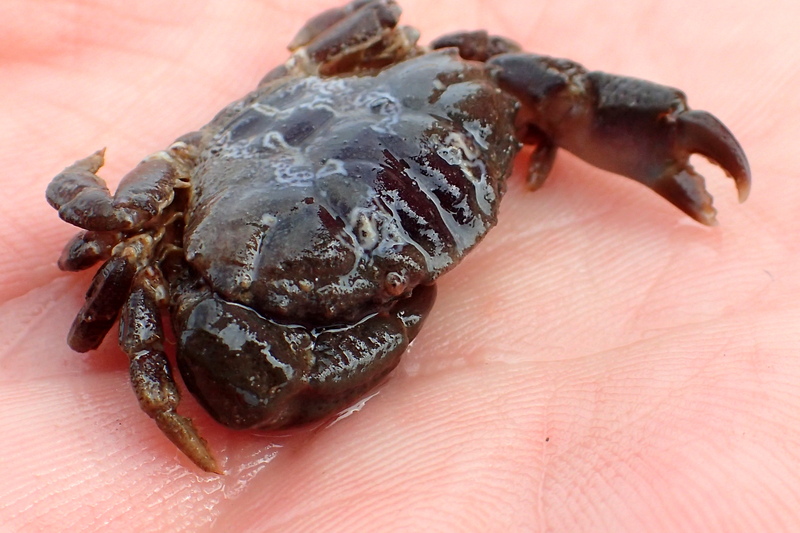 Hannafore beach has strong populations of Xantho incisus and Xantho pillipes crabs, which have furrowed, knobbly edged shells and chunky claws. Pillipes means hairy feet (or something like that) and the thick fringe of hair on the rear pair of legs is the main distinguishing feature. In case anyone’s frowning at my Latin, I’ve just noticed Xantho incisus has been re-named Lothozozymus incisus and I know it was also re-named Xantho hydrophillus at some stage, but it’s just too confusing to try to keep up. We also find the hairy crab, Pilumnus hirtellus, easily distinguished as it is hairy all over and has one claw noticeably larger than the other. Our top find of the day is a new species for me and rather a lovely one. I spot it as a squirming speck on a rock we’ve just lifted. At first I think it’s just another amphipod, but something about it looks different so we put it in a tray with some water and watch it unfurl. It’s a sea slug with antennae (rhinophores) that look like a stack of dinner plates and long waving cerrata along its back that are streaked with red and spotted with white. The two front (oral) tentacles are so long and curving they remind me of a handlebar moustache. This is a Facelina annulicornis sea slug. Sea slugs are far more varied than our land slugs and come in a vast array of colours and shapes, which often help them blend in with the prey they feed on. 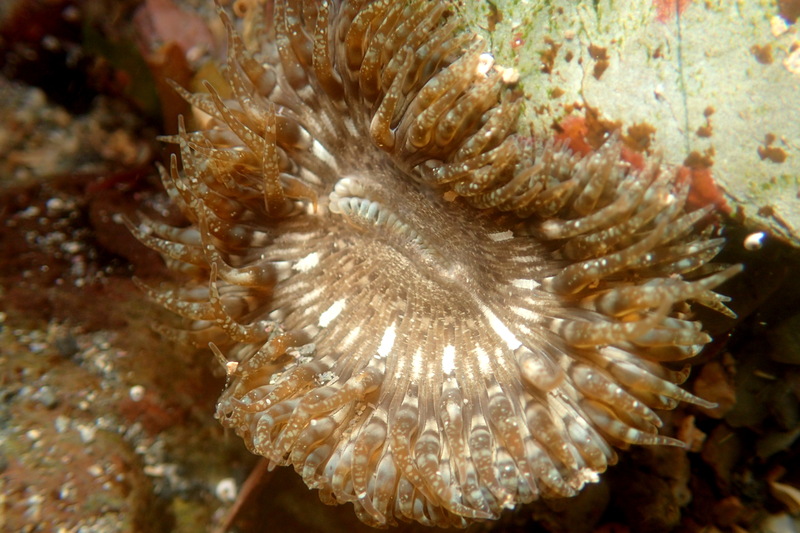 Facelina annulicornis with its front tentacles drooping like a lion-tamer’s moustache. 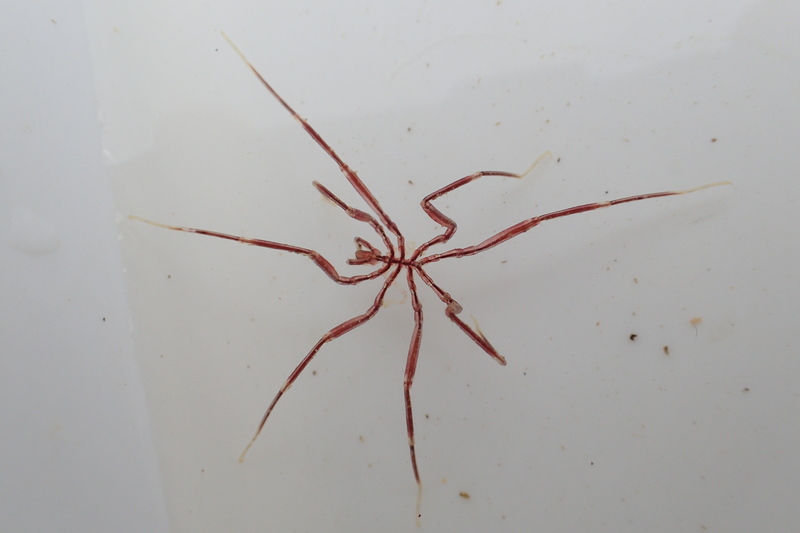 Another highlight is this sea spider (Nymphon gracile), which I spot moving among some weed as I go to replace a crab. These animals have always fascinated me. They seem too delicate to survive in the waves and current, apparently struggling to walk, let alone swim with their spindly legs. A sea spider – Nymphon gracile. The time zips past as we move from one find to the next. There are daisy anemones everywhere among the gravelly sand once we get our eye in. 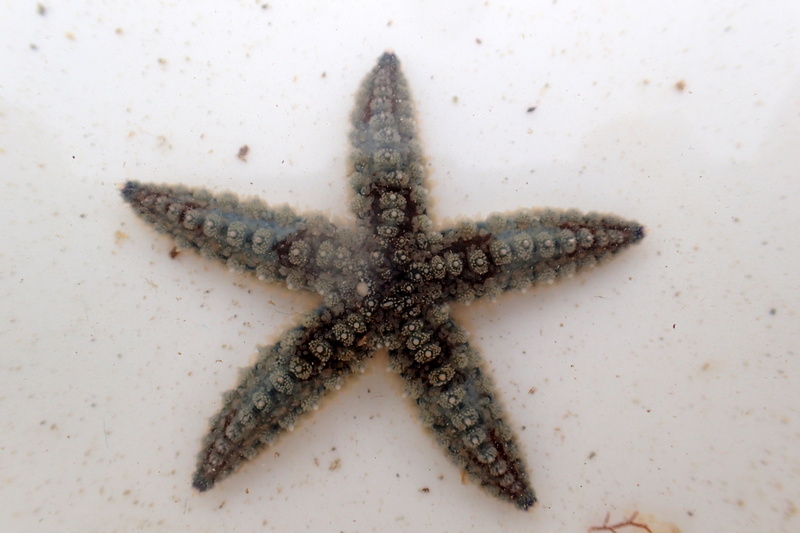 Behind a loose rock we find shore urchins and brittle stars. 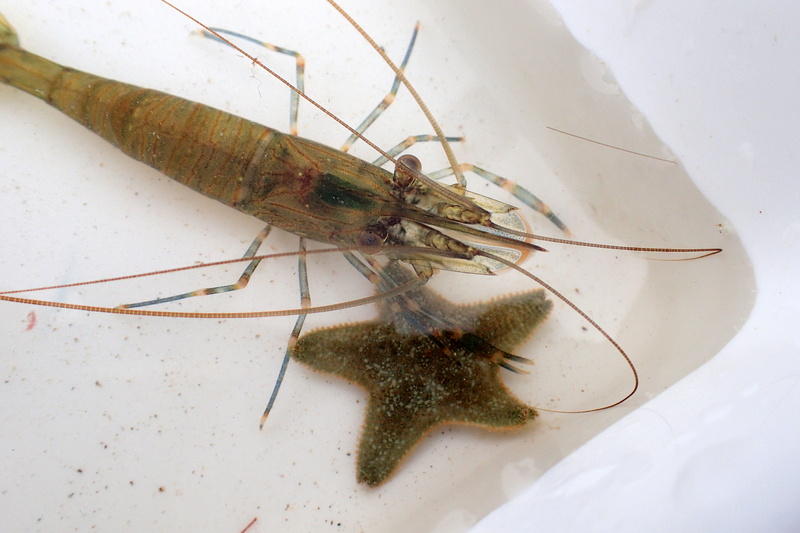 My other half and Cornish Rock Pools junior bring us a bucket full of their finds including some huge common prawns and a rockling, easily identified by its five chin barbels. 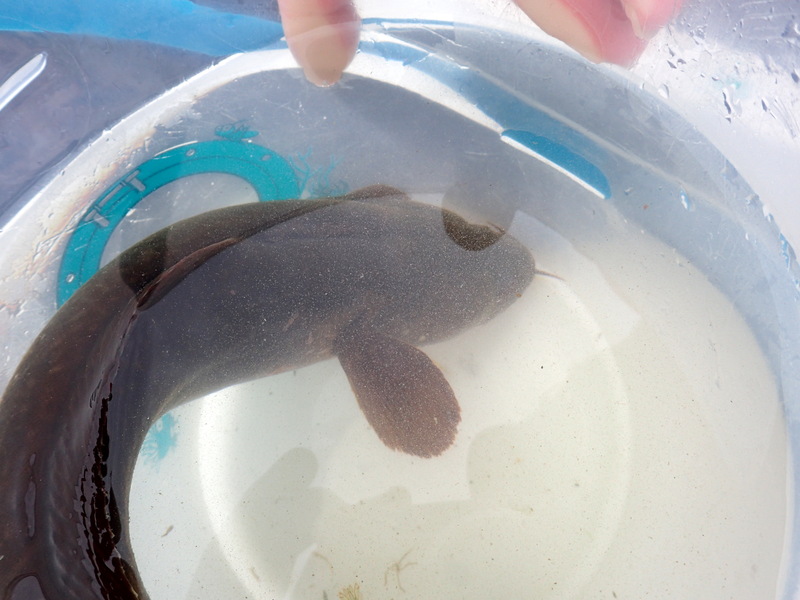 A large shore rockling (which has 3 ‘beards’) looking uncomfortably cramped in our big bucket – it was quickly released. As the tide begins to flow around our shins we see the seaweed ruffled by two large fish moving in the shallows. It takes us a good few minutes of failed attempts before we scoop one up in a bucket in which it barely fits. We keep it just long enough to confirm it’s a shore rockling, a larger species of rockling with just three chin barbels. We release it next to its companion and wade back to shore. 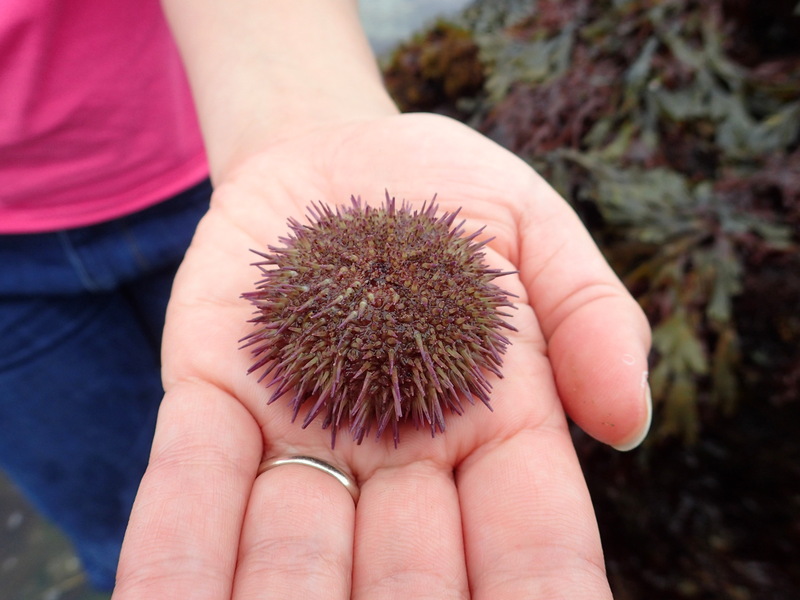 A green shore urchin – smaller and flatter than the edible urchins seen offshore by divers. They have purple-tipped spines. 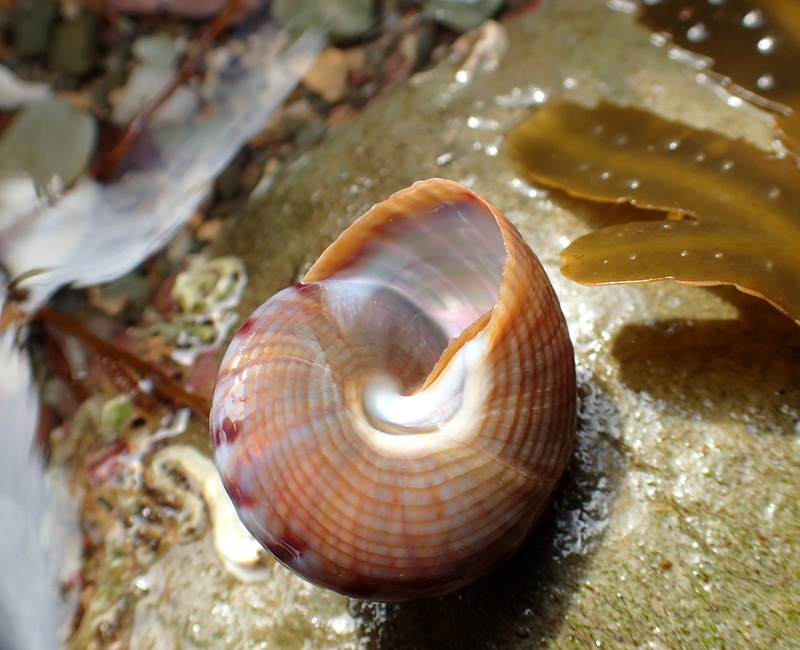 I have a rockpooling convert on my hands. We’re already planning another trip to look for stalked jellyfish and seagrass. On the shore the air doesn’t run out, but the tide still puts a time limit on our explorations. If it didn’t, I suspect we’d stay all day. 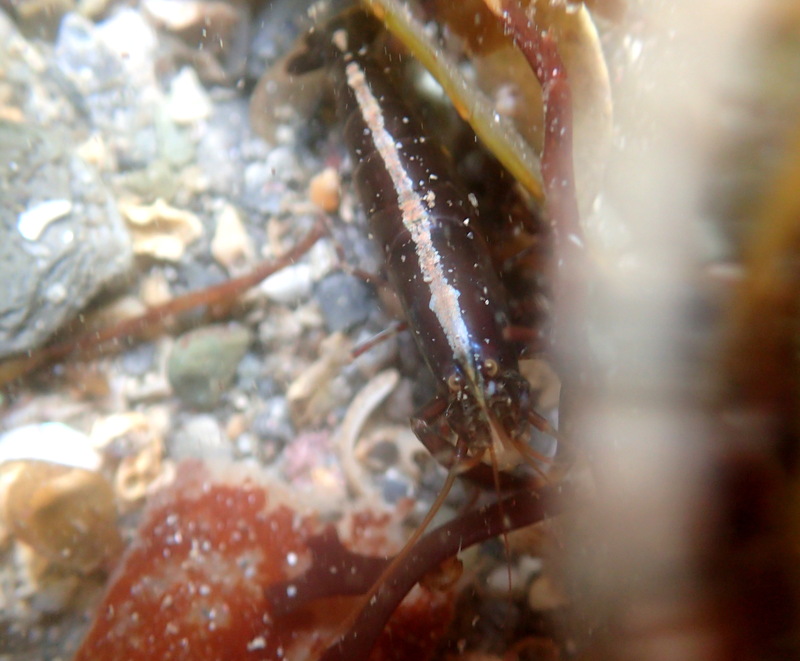 An Athanas nitescens prawn – which has a white stripe down its back and some chunky claws. Thanks Scooj. 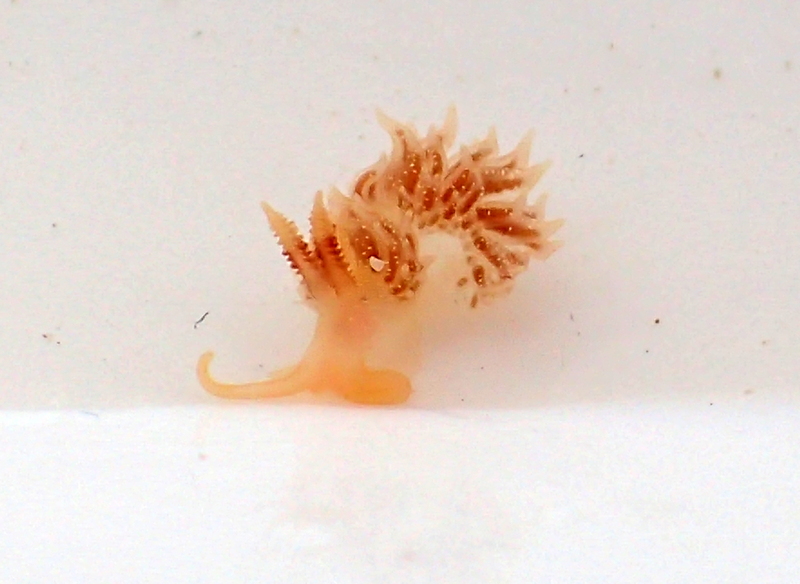 It was a great day and I’m very excited that the sea slug turned out to be something more unusual than I expected. I had such an amazing time! Thank you so much for this tour. I learned so much and am keen to learn some more. I am very much looking forward to the next time!!! Thanks Veronika. I had a great time too. We should definitely go searching for stalked jellies and other things soon. Some great tides the next couple of days so I’m off to see what turns up. Watch this space! It’s amazing. You do good your work, you are excellent guide. I remember it, you remember? After we went to join you for do rock pools, i liked, though i feel afraid to crabs hahaha, sorry. Thanks for all your knowledge that you gave me. Thank you. It was a pleasure to introduce you to Cornwall and our wildlife. I’m so pleased you enjoyed it. A bit of a fear of crabs is probably healthy! If in doubt leave them alone… especially the velvet swimming crabs, even I’m cautious about putting my fingers near them. Thanks for following my blog.